FYR Macedonia’s national broadcaster, MRT, revealed this evening the song Lost and Found, which will try to qualify the Balkan country to the grand final for the first time since 2012. The release of the song was accompanied by the premiere of the music video. 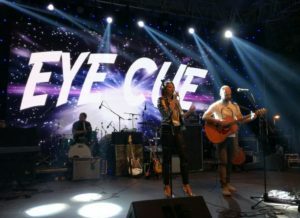 Less than a month ago, MRT announced that pop-rock band Eye Cue will represent FYR Macedonia at the 2018 Eurovision Song Contest. They were internally selected for the contest in Lisbon out of 382 entries, by a jury of eight people. The band, which was formed in 2008, consists of Borjan Trajkovski and Marija Ivanovska. They achieved chart success with their song Magija in 2008, and made it into the MTV Adria Top 20 in 2010 with the song Not This Time. FYR Macedonian’s entry this year is written and composed by Borjan Trajkovski while Darko Dimitrov has been responsible for the production of Lost and Found. Dimitrov is no stranger to the Eurovision Song Contest. In 2006 he composed and produced FYR Macedonia’s Eurovision entry Ninanajna, which finished 12th in the grand final in Athens. This remains the best result for the ex-Yugoslav country in the contest so far. Dimitrov furthermore co-wrote and co-composed FYR Macedonia’s Eurovision entries back in 2014 (Pred da se razdeni) and 2015 (To The Sky), which both failed to qualify for the final of the Eurovision Song Contest. The video for this year’s FYR Macedonian entry has been directed by Jovan Kucinovski.